This complex regulatory framework, which has its origins in the fragmentation of the legal services market in England and Wales, has led to a seemingly novel result: regulatory competition, or competitive regulation. Adopted by the UK Parliament on 30 October 2007, the Legal Services Act entered into effect in stages, with the final elements relating to ABSs entering into effect in 2011 and the SRA issuing the first ABS licenses in March, 2012. The new Legal Services Board (LSB) acts as an oversight regulator, whose primary role is to regulate the approved regulators. Each approved regulator is, in turn, responsible for “front-line” regulation. Responsibility for all complaints across all legal professions is vested in the single body, the Office of Legal Complaints (OLC, or Legal Ombudsman). All regulators are required to act in conformity with defined regulatory objectives. It is no longer only individual lawyers, but also entities that are subject to regulation. Both must be authorized in order to carry on reserved legal activities. Regulated entities include traditional lawyer-owned law firms as well as “licensable bodies,” otherwise referred to as Alternative Business Structures or “ABSs.” ABSs may be owned or managed, in whole or in part, by nonlawyers. In regulating both entities as well as individuals, rules are shifting away from proscriptive, “tick-the-box” approach towards an “outcomes” approach, where the focus is on the outcomes achieved rather than on the processes used to achieve them. The LSB is an independent body that is accountable to the Parliament, through the Lord Chancellor, and with sponsorship by the Ministry of Justice. 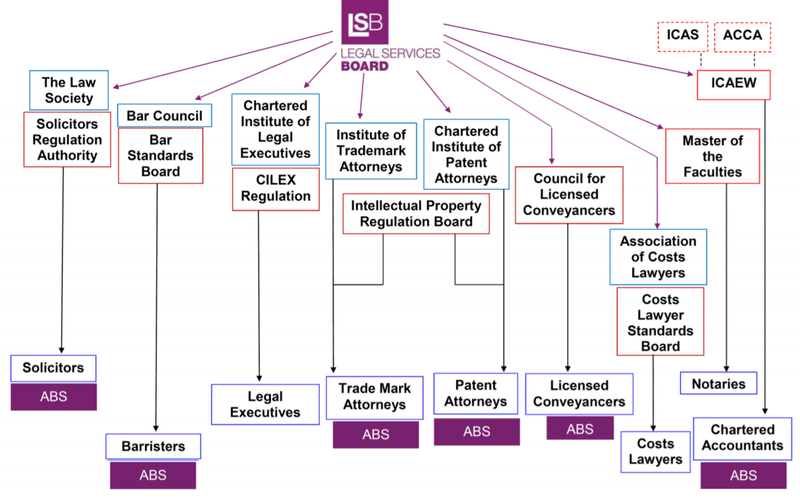 The LSB is responsible for overseeing the regulation of lawyers in England and Wales, and, in that role, it regulates ten “front-line” legal regulatory authorities in England and Wales—those authorities are discussed below. The LSB consists of a chairman, appointed by the Lord Chancellor, and between seven and ten “ordinary” members, appointed by the Lord Chancellor in consultation with the Lord Chief Justice. The chairman and a majority of the ordinary members must be lay persons (that is, they may not be lawyers, nor may they have been lawyers in the past). In appointing ordinary members, the Lord Chancellor is to seek persons who, between them, have expertise or knowledge in the areas of not only the provision of legal services, legal education and training and the workings of courts, but also in a wide range of other areas: consumer affairs, competition matters, the maintenance of professional standards outside the legal profession, the handling of complaints, commercial affairs, the differing needs of consumers, and the provision of claims management services. The period for which an ordinary member is appointed cannot exceed five years, and members cannot be reappointed more than once. In its principal role as “the regulator of regulators,” the LSB has what has been described as “draconian” powers. These include: setting standards for and providing guidance to each front-line regulator, overseeing the OLC, recommending to the Lord Chancellor changes to the scope of reserved legal services (discussed below) and to the functions of approved regulators, and exercising control over the funding of the regulatory system. However, except in exceptional circumstances, the LSB does not have any direct control over regulated individuals or entities—those powers are reserved for the front-line regulators. Figure 4.1: The system for the regulation of legal services in England and Wales today (post implementation of the 2007 Legal Services Act). Click on figure to enlarge. Reprinted with the kind permission of the Legal Services Board. In 2016, the International Bar Association (IBA) issued a draft report in which it questioned the LSB’s independence from government by describing the LSB as an example of “external involvement in the regulatory scheme.” The LSB immediately rejected that claim, stating that it was “entirely misconceived.” This is because, the LSB stated, the appointments process for the members of the LSB takes place under rigorous independent scrutiny” including judicial representation, and, once appointed, the members take their decisions “without fear or favour from government.” Indeed, the LSB stated, “No decision made by the LSB and its executive has ever been at the ‘control’, behest of or subject to any improper influence whatsoever by the government.” Since the statement in the IBA’s draft report was false, the LSB concluded, the IBA should remove it from its final report. 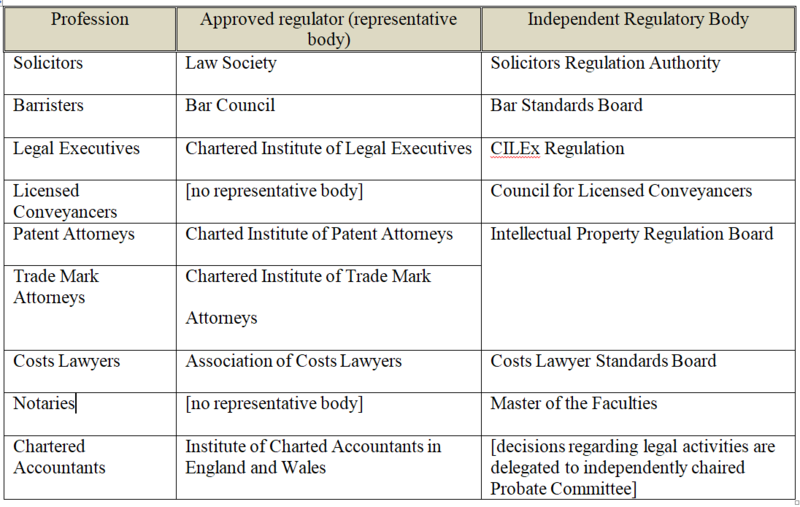 Table 4.1: Front-line regulators which fall under the remit of the LSB Click on table to enlarge. In most cases, it is the regulatory body listed in the right column (not the representative body listed in the left) that has the power to authorize individuals and entities to carry out reserved activities, and that also has the power to take disciplinary action in relation to those same persons. The two principal regulatory bodies for lawyers are the Solicitors Regulation Authority (SRA) and the Bar Standards Board (BSB). Like the chair of the LSB itself, the chairs of the SRA and the BSB are lay persons. Front-line regulators have the right to make their own rules, but they must conform to the rules and guidelines fixed by the LSB, and certain rules require the prior approval of the LSB. A front-line regulator must first seek approval from the LSB before being able to act as a licensing authority. To date, five authorities have requested and have received the authority to license ABSs. Those five authorities are: the SRA, the Council for Licensed Conveyancers (CLC), the Institute of Charted Accountants in England and Wales (ICAEW), the Intellectual Property Regulation Board (IPReg), and the Bar Standards Board (BSB). In the event that a front-line regulator fails in any of its duties and obligations under the Act, the LSB is empowered to take a number of actions, including issuing directions to the front-line regulator to correct the deficiency, publishing a public censure, imposing a financial penalty, appointing a different person to perform the regulatory function, and recommending that the Lord Chancellor cancel the regulator’s approval. This complex regulatory framework, which has its origins in the fragmentation of the legal services market in England and Wales, has led to a seemingly novel result: regulatory competition, or competitive regulation. In essence, in certain contexts and notably with respect to ABSs, legal service providers in England and Wales are not required to work with one regulator—they can select one from a panel of approved regulators. In fact, the phenomena of regulatory competition found in the regulatory framework for legal services in England & Wales is not novel—a number of examples have preceded it, such as that of corporate law in the United States, and notably the choices available to companies as regards state of incorporation. However, even if the phenomena is not novel to England & Wales, its development there nevertheless seems to have sparked an increased interest in the phenomena and its potential for use in other regulatory contexts. The best example of this increased interest is probably Gillian Hadfield’s 2016 book Rules for a Flat World: Why Humans Invented Law and How to Reinvent It For a Complex Global Economy. The phenomena, and Hadfield’s book in particular, is discussed in greater detail in part VI. The LSB conducts research in accordance with a 2010 document that establishes the LSB’s research strategy. According to that document, “The LSB is committed to using research to ensure all the work we do is underpinned by robust relevant evidence.” The LSB has established internally a Research Section charged with establishing and assuring the fulfillment of the LSB’s research program. The LSB makes available on its website its annually updated research program as well as its research reports. In addition to the LSB, the front-line regulators have also established research programs. Most notable among them is the SRA, which publishes its research program each year, as well as a multitude of research reports. In announcing the SRA’s research program for 2016, Crispin Passmore, Executive Director for Policy, described the “ambitious” program as focused on issues “critical to the public interest and expanding and growing our evidence base,” in order to help the SRA to continue making informed decisions. Passmore also stressed the importance for the SRA of understanding the impact of its regulation and of identifying ways to improve and refine its work. The Office for Legal Complaints is the board of the Legal Ombudsman. The OLC is a body subject to the regulatory oversight of the LSB. Through the Legal Ombudsman, this body provides a single, independent avenue for the resolution of complaints against authorized persons (regulated legal service providers). The OLC consists of a chairman and between six and eight additional “members.” The chair is appointed by the LSB, with the approval of the Lord Chancellor, and the members are appointed by the LSB, after consultation with the chairman. The chair as well as the majority of the members must be lay persons (nonlawyers). Under the “scheme” of the Legal Ombudsman, front-line regulators must require authorized persons to have a complaints procedure and to inform their clients of the procedure. In turn, a complainant must first resort to that procedure before it can bring a claim before the Legal Ombudsman. The Legal Ombudsman has the power to “determine” a complaint, and notably, if the Legal Ombudsman decides the complaint is founded, to order redress in a variety of forms (to apologize, to pay monetary compensation, to correct an error …). The Legal Ombudsman does not, however, have the power to take disciplinary action—that falls under the exclusive remit of the front-line regulators. The Legal Services Act requires the LSB to establish and maintain a Consumer Panel for the purpose of representing the interests of consumers to the LSB. This panel is housed at the premises of the LSB, but it is operated independently of the LSB. The Panel consists of eight lay people with a range of expertise (consumer services, consumer protection, competition, market research,…) each appointed by the LSB subject to the approval of the Lord Chancellor. The Panel is supported by a policy secretariat. The Panel is mandated to represent the interests of a variety of consumers of legal services, including not only individuals, but also businesses and not-for-profit organizations. The Panel has the right to publish its advice to the LSB, and it does so regularly. The LSB is not obliged to follow the advice of the Panel but, in the event it disagrees with the Panel’s advice, the LSB is obliged to explain its reasons. Two of the Panel’s most important activities are its issuance of a Tracker Survey and a Consumer Impact Report. The Tracker Report is issued on an annual basis—each year the Panel surveys 3000 members of the general public and consumers of legal services. Each year, the Panel asks the same questions, in order to determine what is and is not changing for them. The Consumer Impact Report is issued every other year. It combines evidence from the Tracker Survey with information from other parts of the sector, in order to shed additional light on what is and is not changing for consumers, where there have been improvements and where more improvement is needed. All regulators—the LSB, the front-line regulators, the OLC—are required to operate in furtherance of eight regulatory objectives. These objectives include: protecting and promoting the public interest, supporting the constitutional principle of the rule of law, improving access to justice, protecting and promoting the interests of consumers of legal services, and promoting competition in the provision of legal services. As Clementi recognized, in permitting ABSs, the regulation of legal services would need to shift, in order to encompass the regulation of not just individuals, but of firms or entities as well. Accordingly, the SRA has modified its regulations to encompass entities as well as individuals (the BSB, the CLC, the ICAEW and the IPReg have also done so, but we will focus here on the SRA, as the largest front-line regulatory body for England and Wales). Notably, the SRA requires recognition and approval of “authorised persons” at two levels: at the level of the individual, and the level of the firm or entity. The SRA’s firm-based authorization requirements begin with the completion of a written application form. The SRA amends the form from time to time; as of the time this book went to press, the form was 14 pages in length. In addition to items like the names of the applicant’s address and expected areas of work (by subject matter), it also requires information such as the applicant’s managers and owners (names), ownership and management structure, expected turnover, and sources of funding (capital or debt). Whether any nonlawyer has the right to impose directions or financial policies on the applicant. The full application form is available on the SRA’s website. Plans to assure equal opportunity and diversity. Indeed, in the SRA’s first years, it was heavily criticized for taking too long to approve applications, and, in particular for taking too long to approve novel structures, against which the SRA was accused of having “an inherent cognitive bias.” During those years, while “simple” applications might (or might not) have been processed quickly, the novel or complex ones took anywhere from 5 to 12 months for the SRA to process, with some taking as long as two years. Today the average processing time is 2.5 months, with the longest taking about six months. 1) Compliance Plan: Every firm must have in place formal systems and plans to ensure that the firm complies with applicable ethical, professional and accounting standards. 2) Compliance Officer for Legal Practice (COLP) and a Compliance Officer for Finance and Administration (COFA): Every firm must at all times have a designated COLP as well as COFA. The COLP is responsible for ensuring that the firm has in place the systems and controls needed to comply with the applicable ethical and professional standards (as set forth in the Handbook). These persons bear principal (but not sole) responsibility for the firm’s compliance and they are obliged to report to the SRA material non-compliance. Both the COLP and the COFA must be “fit and proper” to undertake their roles. In addition, the COLP must be either a lawyer of England or Wales, or a Registered European Lawyer (or certain other kinds of European lawyers, but a Registered Foreign Lawyer does not qualify). The COFA is responsible for ensuring that the firm complies with the SRA’s accounting rules. 3) Qualified to Supervise: At least one manager of the firm must be “qualified to supervise.” A person is deemed to be qualified to supervise if he/she: (i) has been entitled to practice and has practicing as a lawyer for at least 36 months within the past 10 years, and (ii) has completed training specified by the SRA. In regulating both entities as well as individuals, the SRA has shifted its rules away from a proscriptive, “tick-the-box” approach towards “outcomes focused regulation” (OFR), described as an approach focused on the outcomes achieved rather than on the processes used to achieve them, and as a rejection as a “one size fits all” approach to regulation. “Outcomes” … describe what you are expected to achieve … in specific contexts…. The outcomes are mandatory. “Indicative behaviors” … provide non-mandatory examples of the kind of behaviors which may establish whether you have achieved the relevant outcomes. The SRA has the power to investigate misconduct by an ABS, and to require explanations and documentation in that regard. If the SRA determines that the ABS or someone in connection with it has not respected the terms of its license or has engaged in dishonesty, and if the SRA deems that it is necessary to take action in order to protect the interests of the clients or the public, then the SRA may revoke the ABS’s license and “intervene” in the ABS. In intervening, the SRA appoints an intervention agent, who is responsible for liquidating the ABS in an orderly manner. Front-line regulators that act as licensing authorities for ABSs are required to maintain and publish a registry of the ABSs that they have authorized. Each of the SRA, the CLC, and the ICAEW maintain these registries on their respective websites. Each of IPReg and the BSB, respectively, maintain a separate registry. In England and Wales, non-legally qualified persons have always been, and today they continue to be able to provide legal services. The only restriction has been that they may not provide any of the six “reserved activities.” Only these six activities may be performed by qualified lawyers: the exercise of rights of audience (appearing as an advocate before a court); the conduct of litigation (issuing proceedings before a court and commencing, prosecuting, or defending those proceedings); reserved instrument activities (notably the conveyancing of real property); probate activities; notarial activities, and the administration of oaths. The activities that appear on this list are far less interesting than the activities that do not appear on it. Notably, activities such as preparing contracts and providing legal analysis and advice do not appear. There is no need to be a qualified lawyer to be able to perform those, or, indeed, any other “legal” activity that is not one of the six reserved activities. In other words, outside of a narrow list of restricted activities, there is no lawyer monopoly on the provision of legal services in England or Wales. In addition to being open to nonlawyers performing legal activities, England and Wales has for a long time been open to foreign lawyers. Their rules permit lawyers from nearly anywhere in the world to establish themselves and be regulated there, as Registered Foreign Lawyers, or, if they are members of the bar of a Member State of the European Union, then as Registered European Lawyers. These lawyers can do so without attending law school or taking a bar exam in England and Wales. Their only restrictions are that they cannot claim to be solicitors or barristers (or other kind of UK lawyer) and, in the case of Registered Foreign Lawyers, they cannot engage in any of the six reserved activities. The lack of a general monopoly on the provision of legal services and the ease with which foreign lawyers may work in England and Wales are additional evidence of the openness of the English and Welsh legal services market. As a result of this openness, from a base in England or Wales, it is not just possible but relatively easy to offer legal services in the law of pretty much any country in the world. Crispin Passmore, Executive Director, Solicitors Regulation Authority (in book): Passmore explains how the SRA inherited a “traditional and old-fashioned” regulatory system driven by the needs of the legal profession, and the SRA’s ongoing journey to transform the system to one focused on consumers of legal services. Elisabeth Davies, Chair, Legal Services Consumer Panel: Davies explains why it is important that the Legal Services Act requires the establishment of the Panel and the vital contributions the Panel makes towards an understanding the needs of consumers of legal services. “SRA Unveils Its First Three ABSs,” Legal Futures, March 28, 2012, http://www.legalfutures.co.uk/latest-news/breaking-news-sra-unveils-its-first-three-abss. For another overview of the current regulatory framework in England and Wales, see Hadfield and Rhode, “How to Regulate Legal Services,” 1204-1211. Framework Document: Agreement between the Ministry of Justice and the Legal Services Board,” June, 2011, 8, http://www.legalservicesboard.org.uk/about_us/lsb_framework_document/pdf/moj_framework_agreement_june_2011.pdf. 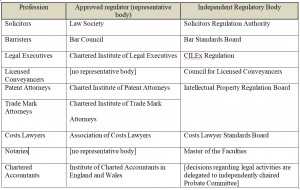 “LSB Could Pose Risk to Independence of Legal Profession, Warns Law Society President,” Legal Futures, May 25, 2010, http://www.legalfutures.co.uk/latest-news/lsb-could-pose-risk-to-independence-of-legal-profession-warns-law-society-president. Patricia Robertson and Katherine Watt, “The Regulatory Framework,” in Guide to the Legal Services Act 2007, ed. James Thorne and Iain Miller (UK: LexisNexis, 2009), 16. Michael Cross, “IBA 2016: Legal Independence in E&W Under Attack,” The Law Society Gazette, September 22, 2016, https://www.lawgazette.co.uk/news/iba-2016-legal-independence-in-eandw-under-attack/5057851.article. Neil Buckley, Letter to David W. Rivkin, September 23, 2016, http://www.legalservicesboard.org.uk/news_publications/speeches_presentations/2016/20160923_LSB_Letter_Re_Draft_Report_IBA_Pres_Task_Force_Independance_Of_Legal_Prof.pdf. Robertson and Watt, “The Regulatory Framework,” 25. “Approved Regulators,” Legal Services Board, accessed March 20, 2017, http://www.legalservicesboard.org.uk/can_we_help/approved_regulators/. Robertson and Watt, “The Regulatory Framework,” 13. Frank H. Stephen, Lawyers, Markets and Regulation (Cheltenham, UK: Edward Elgar, 2013), 119. For a more detailed discussion of the potential advantages and disadvantages of regulatory competition, see Baldwin, Cave and Lodge, Understanding Regulation, 356-369. Frank H. Stephen, Lawyers, Markets and Regulation, 118-119. Gillian Hadfield, Rules for a Flat World: Why Humans Invented Law and How to Reinvent It For a Complex Global Economy (New York: Oxford University Press, 2016). Legal Services Board, “Research Strategy,” June 14, 2010, 2, http://www.legalservicesboard.org.uk/what_we_do/Research/pdf/lsb_research_strategy_2010_formatted_version.pdf. 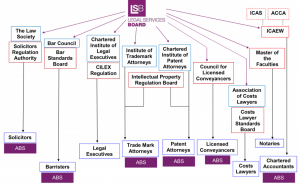 “About LSB Research: LSB research programme,” Legal Services Board, accessed March 20, 2017, https://research.legalservicesboard.org.uk/about-lsb-research/lsb-research-programme/. “Reports,” Legal Services Board, accessed March 20, 2017, https://research.legalservicesboard.org.uk/reports/. “Research and Reports,” Legal Services Board, last modified October 25, 2016, http://www.sra.org.uk/sra/how-we-work/reports.page. “News Release: Research Projects to Inform the Work of the SRA,” Legal Services Board, January 4, 2016, http://www.sra.org.uk/sra/news/press/research-programme-2016.page. Patricia Robertson and Katherine Watt, “The LSB’s Role in the Regulatory Framework,” in Guide to the Legal Services Act 2007, ed. James Thorne and Iain Miller (UK: LexisNexis, 2009), 46-51. “Office for Legal Complaints (OLC) Operating Framework,” July, 2012, 2, http://www.legalombudsman.org.uk/wp-content/uploads/2014/08/OLC-Operating-framework-20121.pdf. Robertson and Watt, “The Regulatory Framework,” 21. Nicholas Peacock, “The Office for Legal Complaints,” in Guide to the Legal Services Act 2007, ed. James Thorne and Iain Miller (UK: LexisNexis, 2009), 82-85. “Panel Members,” Legal Services Consumer Panel, accessed March 17, 2017, http://www.legalservicesconsumerpanel.org.uk/aboutus/panel_members/index.html. “Welcome to the Legal Services Consumer Panel,” Legal Services Consumer Panel, accessed March 17, 2017, http://www.legalservicesconsumerpanel.org.uk/index.html. Robertson and Watt, “The LSB’s Role,” 54. For more information, see “Consumer Impact Report,” Legal Services Consumer Panel, accessed March 17, 2017, http://www.legalservicesconsumerpanel.org.uk/ourwork/consumerwelfareindex.html. The form can also be downloaded from this page: “New Applicants,” Solicitors Regulation Authority, accessed March 17, 2017, http://www.sra.org.uk/solicitors/firm-based-authorisation/authorisation-recognition.page. Form FA1 v19 dated July 23, 2015. It appears that this version of the form is no longer available online. A copy is on file with the author. Monidipa Fouzder, “SRA Says ‘Sorry’ Over ABS Application Delays,” The Law Society Gazette, April 27, 2015, http://www.lawgazette.co.uk/practice/sra-says-sorry-over-abs-application-delays/5048340.fullarticle. Robert Cross, “Balancing Regulatory Risk,” (presentation at UCL International Access to Justice Conference, London, England, June 20, 2014), 25, https://research.legalservicesboard.org.uk/wp-content/media/UCL-AtoJ-Conference-presentation-20-June-2014.pdf; see also Neil Rose, “SRA’s Approach to Licensing ABSs ‘Damaging Competition, Consumers and Access to Justice,’” Legal Futures, April 9, 2014, http://www.legalfutures.co.uk/latest-news/sras-approach-licensing-abss-damaging-competition-consumers-access-justice. Dan Bindman, “Cypriot Construction Consultancy Becomes ABS for its International Kudos,” Legal Futures, January 17, 2014, http://www.legalfutures.co.uk/latest-news/cypriot-construction-consultancy-becomes-abs-international-kudos. Neil Rose, “SRA Finally Taken Off Report Over Way It Handles ABS Applications,” Legal Futures, May 20, 2015, http://www.legalfutures.co.uk/latest-news/sra-finally-taken-off-report-over-way-it-handles-abs-applications. See also Nick Hilborne, “Not So Slow: SRA Approving Alternative Business Structures in Only Two Weeks,” Legal Futures, February 17, 2016, http://www.legalfutures.co.uk/latest-news/not-so-slow-sra-approving-alternative-business-structures-in-only-two-weeks. See SRA Code of Conduct, Chapter 7, “Management of Your Business,” November 1, 2015, http://www.sra.org.uk/solicitors/handbook/code/content.page. See also SRA Authorisation Rules for Legal Services Bodies and Licensable Bodies 2011, Rule 8.2, “Suitable Arrangements for Compliance, http://www.sra.org.uk/solicitors/handbook/authorisationrules/content.page. See generally, “COLPs and COFAs,” Solicitors Regulation Authority, accessed March 20, 2017, http://www.sra.org.uk/solicitors/colp-cofa.page. “What is a COLP and COFA?” Solicitors Regulation Authority, last modified May 13, 2013, http://www.sra.org.uk/solicitors/colp-cofa/ethos-roles.page#roles. “Responsibilities of COLPs and COFAs,” Solicitors Regulation Authority, last modified September 10, 2014, http://www.sra.org.uk/solicitors/colp-cofa/responsibilities-record-report.page. See Practice Framework Rules, Rule 12, “Persons Who Must Be ‘Qualified to Supervise,’” November 1, 2015, http://www.sra.org.uk/solicitors/handbook/practising/part3/rule12/content.page. See Indemnity Insurance Rules, Rule 4, “Obligation to Effect Insurance,” November 1, 2015, http://www.sra.org.uk/solicitors/handbook/indemnityins/part2/content.page. See SRA Indemnity Insurance Rules 2013 – Appendix 1, “SRA Minimum Terms and Conditions of Professional Indemnity Insurance,” http://www.sra.org.uk/solicitors/handbook/indemnityins/appendix-1/content.page. Frank Maher, “PII Renewal: The Insurance Issues Facing Law Firms,” LexisNexis Future of Law Blog, May 28, 2013, http://blogs.lexisnexis.co.uk/futureoflaw/2013/05/pii-renewal-the-insurance-issues-facing-law-firms/. Solicitors Regulation Authority, “Outcomes-Focused Regulation at a Glance: Your Quick Guide to Getting Started with OFR and the New Handbook,” undated, http://c.ymcdn.com/sites/ncbp.org/resource/collection/F9556696-FF20-442A-B922-0FE6CFD2FB3E/Outcomes_focused_regulation_Redacted.pdf. See SRA Code of Conduct, Chapter 1, “Client Care,” November 1, 2016, http://www.sra.org.uk/solicitors/handbook/code/part2/content.page. See SRA Code of Conduct, Chapter 7, “Management of Your Business,” November 1, 2016, http://www.sra.org.uk/solicitors/handbook/code/part3/rule7/content.page. See SRA Code of Conduct, Chapter 4, “Confidentiality and Disclosure, November 1, 2016, http://www.sra.org.uk/solicitors/handbook/code/part2/rule4/content.page. “Intervention into a Practice,” Solicitors Regulation Authority, last modified September 19, 2016, http://www.sra.org.uk/solicitors/enforcement/intervention-tribunal/intervention-reasons-costs.page. “Search for a Licensed Body (ABS), Solicitors Regulation Authority, accessed March 17, 2017, http://www.sra.org.uk/solicitors/firm-based-authorisation/abs/abs-search.page. “ABS Register,” Council for Licensed Conveyancers, accessed March 20, 2017, http://www.conveyancer.org.uk/CLC-Consumers/ABS-Register.aspx. “Probate Register,” Institute of Chartered Accountants in England and Wales, last modified January 24, 2017, http://www.icaew.com/-/media/corporate/files/technical/legal-and-regulatory/probate-and-abs/probate-register-2017.ashx. “The following entities are registered with IPReg as at 30 May 2017,” IPReg, http://ipreg.org.uk/wp-content/files/2017/05/Registered-Bodies-List-170530.pdf; Bar Standards Board, “Entities, Including Alternative Business Structures,” accessed June 19, 2017, https://www.barstandardsboard.org.uk/regulatory-requirements/entities,-including-alternative-business-structures/. “Reserved Legal Activities,” Legal Services Board, accessed March 17, 2017, http://www.legalservicesboard.org.uk/can_we_help/faqs/Reserved_Legal_Activities.htm. See generally, “Registered European Lawyers and Registered Foreign Lawyers,” last modified December, 2016, http://www.sra.org.uk/solicitors/registered-european-foreign-lawyers.page.